grows in days to come and the cherished dream Swami Vivekananda is fulfilled to have an ideal India. teachings of Swami Vivekananda were more relevant today than when he addressed the World Religious conference on this day in 1893 at Chicago when Swamiji gave call for ' Universal Brotherhood'. 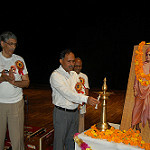 honour also stressed on the youth be close to Swami Ji’s teachings. stressed on the self transformation among the youths to see the dream of Swami Vivekananda of a prosperous India in right perspective comes true. hundreds from six Post Graduate colleges of the district participated in the marathon. for organizing such an impressive program. participant too was felicitated on the occasion marathon. The winners were given besides cash prize of few thousand rupees, a set of complete works of Swami Ji and a certificate. Devi amid standing ovation . 1000 T shirts were distributed free among the participants with free cap. Fruits and water was kept available for the participants at DRPGMC Tanda. A book sales centre was set up outside the auditorium of DRPGM College Tanda Hindi and English dailies covered the event. E.O.M.